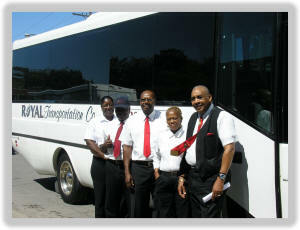 You'll recognize our drivers by their tuxedos, smiles and commitment to YOUR satisfaction! Sparklin' Clean, Well-Maintained Vehicles, Experienced Professional Drivers, Prompt, Courteous Service... that's the Royal Treatment! Our Drivers are Employees, not sub-contractors, and all are Fully Licensed and Insured.